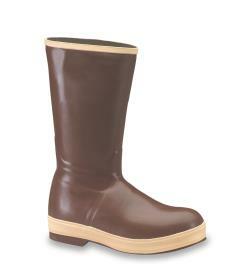 Honeywell Xtratuf 22273G Steel Toe Neoprene Boot is an Alaskan staple in the commercial fishing industry. These 15 inch Xtratuf boots provide flexible, all-day comfort and the best protection against the broadest range of acids, corrosives and contaminants. Honeywell Steel Toe Boot 22271G is 100 percent waterproof, offers seamless, flexible, hand-layered construction. Triple-dipped shells for extra tough, extra watertight protection, Chevron outsole and heel. The Xtratuf Legacy Boot also features built-in cushion insoles with arch support. Built-in foam insulation.